Watch our This is LA segment. Watch our Marry Me Today segment. Watch our NBC interview with Adiamor COO Sam Sarkisian about the benefits of buying diamonds and fine jewelry online. Adiamor engagement ring and wedding rings were recently featured on the television show “Marry Me Today” on A+E’s FYI Network. The reality show produced by The Knot is about an ambitious groom-to-be Brandon that proposes and gets married the same day to his girlfriend Jolie. The show follows Brandon and The Knot’s Liliana Vazquez as they planned everything from the proposal to completing the ceremony within one week. One of the most important parts of the show, the proposal, and the wedding are the engagement ring and wedding rings provided by Adiamor. Brandon and Lilliana visited Adiamor to pick out her dream 8-9mm oval cut Morganite engagement ring that Jolie referred to as “The One!” on her The Knot board as well as his and her wedding bands. The experience was shared on Twitter with Tweets live and afterwards by @adiamor, @FYI, @theknot, @cheapchicas, and @44blue and on other social media including Facebook and Instagram. Even Brandon and Jolie commented on Adiamor social pages. Read more about the show and Adiamor here. You can view the show in its entirety here. FYI is a division of A+E Television Networks. It is a joint venture of the Disney-ABC Television Group and Hearst Corporation. FYI covers a wide range of experiences and stories that reflect how people live their lives today, not defined by just one interest or passion. The Knot is the nation's top wedding resource, reaching almost every couple in America through the #1 wedding website TheKnot.com, mobile apps, The Knot local and national wedding magazines, The Knot book series, and syndicated columns in newspapers nationwide. The Knot is a brand of XO Group Inc.
Adiamor is an Internet jewelry retailer that specializes in engagement and wedding band designs. The rings are made in house at the company’s locations in the Los Angeles jewelry district. For over five decades, Adiamor has been creating hand-crafted, unique engagement and wedding rings. Adiamor helps couples turn their day of love into a lifetime of memories. Adiamor was recently featured on the television show Acceso Total on NBC Universal’s Telemundo. 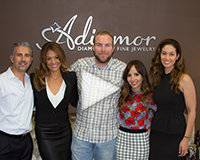 Entertainment host Elva Saray visited Adiamor to talk with jewelry designer Jennifer Sarkisian and one of the heads of manufacturing Tomas Zapata. They discussed diamond engagement rings and jewelry gifts for Valentine’s Day. Jennifer identified what is hot for engagement rings and described a sampling of pendants, earrings, eternity bands, three stone rings, and other diamond jewelry items. Tomas discussed the manufacturing and diamond setting process and showed some of the techniques that are used by the Adiamor artisans. 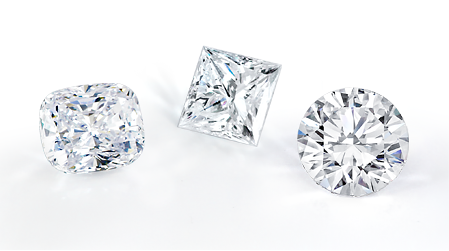 The segment also included information about the 4Cs of diamond grading which are carat weight, cut, clarity, and color. There were several closeups of gorgeous round, princess cut, emerald cut, and heart shaped diamonds which are a popular choice for Valentine’s. One of the topics that was discussed is how safe it is to buy diamonds and fine jewelry online from Adiamor. The two main reasons identified were GIA diamond certification is very strict so you know what you are paying for and all items come with a 30 day money back guarantee. The segment was aired on Telemundo 52 in Los Angeles and affiliates in Las Vegas, Tucson, Phoenix, Denver, Houston, Dallas, San Antonio and Chicago. Telemundo, a division of NBCUniversal, is a world-class company leading the media industry in the production and distribution of high quality Spanish language content across its multiplatform portfolio to U.S. Hispanics and audiences around the world. Adiamor is an online jewelry retailer that specializes in engagement rings, wedding bands, fine jewelry, and loose diamonds. The rings and jewelry are made in house at the company’s locations in the Los Angeles jewelry district. For over five decades, Adiamor has been creating hand-crafted, unique bridal and diamond jewelry. Adiamor helps couples turn their day of love into a lifetime of memories. Adiamor donated Diamond Heart Key Necklace as the premium prize for Family Paths fundraiser featuring Twitter's Janet Van Huysse as the keynote. The Women's Leadership Luncheon and raffle will be held Thursday, September 25 in San Francisco. This Thursday Family Paths, a nonprofit community service organization that strengthens family relationships by providing mental health and supportive services, welcomes Twitter's head of Leadership Development and Inclusion Janet Van Huysse as a keynote speaker. Her lecture, "The Engaged Workplace: Impacting Home and Community from Hyperlocal to Global", is part of the organization's Women's Leadership Luncheon Series. Jeweler Sam Sarkisian, owner and CEO of Adiamor, voiced his support for Family Paths' continuing contributions to families, stating "We are honored to provide jewelry that will raise money for a great cause." Family Paths is delighted to present Ms. Van Huysse as this year's keynote speaker and welcomes you to share in her professional insights and inspiring message. The Women's Leadership Luncheon and raffle will be held at 155 Sansome St. in San Francisco, September 25 from 11:30AM-1:30PM. For more information about the non-profit Family Paths and to register for the event, visit http://www.FamilyPaths.org. About Family Paths For more than 40 years, Family Paths has worked to strengthen children and families through promoting healthy relationships, providing mental health outreach, and offering education and support services. About Adiamor For five decades, Adiamor has made engagement and wedding day dreams come true by creating unique, hand-crafted diamond engagement, wedding, and fine jewelry. Headquartered in the historic jewelry district in downtown Los Angeles, Adiamor has worked with thousands of couples to design and manufacture the perfect jewelry for any occasion. Adiamor is pleased to have helped Style Expert Lilliana Vazquez to the “best day ever!” when she and a friend came by our Downtown Los Angeles location to help a friend pick an engagement ring. She shared her experience with fans and friends via both Twitter @cheapchicas and Instagram. During the visit, she shared a picture of one of her favorites, the Hand-Crafted Cushion Halo Setting R2839 which can be seen in rose gold with a 1.75 carat round diamond in the center on the Adiamor blog. This ring features 38 brilliant cut diamonds set around the center stone and down the sides of the band. The Cushion Halo Setting is also available in both 14K and 18K white and yellow gold, as well as platinum. Other center stones are also available for this ring setting. Other rings similar to the one Vazquez shared through social media include the Braided Pave Setting, the Pave Split Shank Setting and the Petite Milgrain and Pave Engagement Setting. About Lilliana Vazquez With more than 250 appearances on broadcast television, Lilliana Vazquez is well known for her tips and advice on affordable, yet fashionable, style. She has been seen on shows such as TBS’ Movie and a Makeover and is currently the Style Correspondent for Daily Candy and a host on New York LIVE on NBC New York. She is also the founder and editor-in-chief of The Cheap Chica’s Guide to Style, which is a must have for every frugal fashionista. 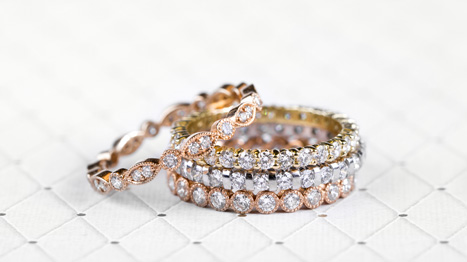 About Adiamor Online jewelry retailer Adiamor specializes in engagement and wedding ring designs, which are made in-house at the company’s location in the jewelry district of Los Angeles. For five decades, Adiamor has been creating unique, hand-crafted diamond engagement and wedding rings. Adiamor helps couples turn their day of love into a lifetime of memories. Founded in 1998, Adiamor Diamond Engagement Rings has helped thousands of customers find just the right diamond engagement ring at just the right price. This year, in commemoration of Valentine’s Day, Adiamor is enhancing its tradition of service with a list of the most interesting ways to propose. Assemble a photo album that chronicles your relationship from the beginning. The album itself can be a new, high-quality item or it can be a vintage piece in excellent condition. Make sure the last page has a special picture of the two of you with the caption ‘Will You Marry Me?” underneath, and don’t forget to leave some space for the ‘She Said Yes!” picture. There are several variations on the theme of surprising a bride-to-be with a marriage proposal on Valentine's Day. Rent a billboard along a popular commute path or the scoreboard of a favorite hometown sports team. Have a magician materialize the ring from out of nowhere or ask the waiter at a fancy restaurant present it on a tray of rich desserts. Whatever the method, surprise is the key; it’s best to match the proposal to the day’s activities. Travel back in time to your first date together and re-create it as faithfully as possible. Near the end of the date get down on one knee, pull out the engagement ring and propose. This idea will be easier for some than for others, but properly executed it will be the memory of a lifetime. A public venue proposal is fun and exciting, but especially when surrounded by loved ones. Maintain the surprise by going on a romantic date for two but arrange for friends and family to show up “unexpectedly” a few at a time. The Best Man should be the last to arrive, handing over the box with the diamond engagement ring in it as you drop to one knee and propose in front of everyone. Lead the bride-to-be on a treasure hunt, working through the clues together to find the hidden engagement ring treasure. Write little notes that lead through every room of the house or make pointers out of sticks and stones along the path of a favorite hiking trail. Whatever the place, each clue should have its own reward that builds anticipation for the next; favorite candy bar, a single rose, a box of truffles, theater tickets - each leading up to X marking the spot of a diamond engagement ring and a proposal of marriage! Adiamor’s Marketing Manager Sarah Harris says, “Valentine’s Day is the perfect day to propose. It’ll make your engagement date easy to remember and give you one more anniversary to celebrate.” The perfect ring on the perfect day is the life-long dream of every bride-to-be, and Adiamor has been helping customers find both since 1998. Adiamor.com carries an extensive collection of the finest diamond engagement rings and exquisite diamond jewelry for any occasion. Adiamor prides itself on tremendous value and outstanding customer service and offers a 100% Satisfaction guarantee to prove it. Visit Adiamor.com today and let us help turn that special day into that perfect day. Adiamor agrees that diamonds are forever but in light of the economic times spending a bag full of cash is not the wisest choice. Saying "I love you" should not break the bank. Spending a small fortune for a diamond engagement ring does not improve the chances of a successful relationship, as a matter of fact it may cause stress in the relationship if paying for it puts a strain on finances. Financial straits are the number one reason that marriages fall apart. In response to the growing demand for affordable diamond engagement rings, there have been quite a few companies that have opened up online venues. Online venues allow the seller to reduce costs that are associated with typical retail jewelry stores. Adiamor, has stepped up to become one of the leaders in online sales of affordable diamond engagement rings. Adiamor.com has a wide selection of loose diamonds, diamond jewelry and engagement settings. This Los Angeles Company has excelled, one of the reasons being that they manufacture all of the jewelry that they sell, right in the heart of the Los Angeles diamond district. Reducing their costs even more, and passing even greater savings onto their customers. Owner, Sam Sarkisian, attributes Adiamor's success to the incredible savings that purchasing online and buying direct from the manufacturer brings. "Getting rid of the middle man and his cut, helps the consumer keep more cash in their own pocket instead of lining someone else's." Of course the triple A rating that Adiamor prides themselves on from the Better Business Bureau may also be a key factor to their success in the online diamond engagement ring market. 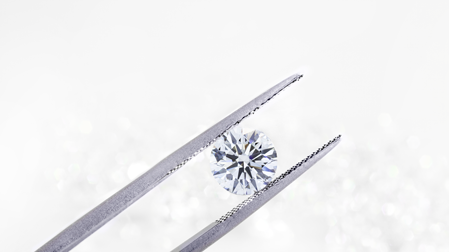 Adiamor.com allows the client the option to personally select which diamond and setting is right for them. Prices are very affordable and the selection is unique which allows Adiamor's customers the ability to design and choose their diamond and ring from beginning to end. Custom selection in Diamonds and settings is definitely a hot ticket with the romance crowd. Who can say no to a high quality, and still affordable diamond engagement ring built specifically for her? Purchasing a diamond engagement ring through an online vendor is a great way to save some money; a couple of precautionary steps will go a long way in picking the right vendor. Make sure you are familiar with and fully understand the return and exchange policies and check with the BBB for the company's rating. Do your research and know what you are buying by understanding how diamonds are graded and evaluated, and don't get in over your head, buy what you can afford. And finally, buy from a well trusted source. The Holiday shopping season is well underway, and joining the masses are the hopeful but often clueless men charged with finding a perfect engagement ring for their June bride-in-waiting. While a diamond engagement ring is a lifetime investment, many engagement ring shoppers research their next vehicle or television purchase more thoroughly, often proving costly. 1. Not learning about the four Cs of diamonds: Unsuspecting shoppers for diamond engagement rings could find themselves at the mercy of a "used car salesman," if they don't prepare themselves beforehand. The solution: Know the four Cs: cut, color, clarity and carat. Cut refers to a diamond's proportion and how it affects its brilliance. It is regarded to be the most important trait. The color of a diamond is graded on a scale and has a significant impact on its value. Clarity denotes inclusions and blemishes within and on a diamond's surface, which can detract from its beauty. 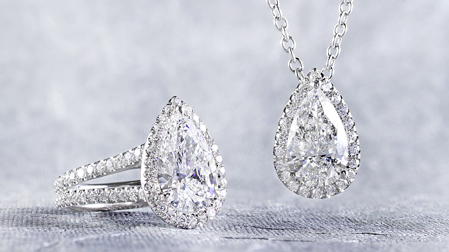 The weight of a diamond is measured in carats. 2. Shopping at a mall: Traditional, brick-and-mortar retailers in shopping malls have extremely high overhead, which they pass on to customers, said Harris. "Commercial locations have to tack on so much money to see any kind of profit." The solution: Consider buying direct from a manufacturer. Direct online manufacturers "can typically beat commercial retailers by 30 to 40 percent," Harris said. 3. Not comparison shopping: "Many customers fear shopping for diamond engagement rings online because of the negative stigma associated with it," Harris said. The solution: Shop online with confidence. The days of consumer wariness regarding online transactions are over and the online commerce regulation sites like Bizrate and the Better Business Bureau help consumers shop with confidence. Buyers should steer clear of online diamond engagement ring retailers without positive feedback on regulation sites. 4. Settling for the first ring: "Make sure to look at a variety of rings," said Harris. Engagement ring shoppers are often pressured by overzealous salespersons more concerned with making a commission than providing valuable customer service. The solution: Take a peek at the ring recipient's jewelry box to see what pieces she already has. 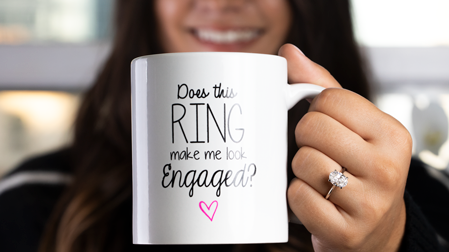 This is often the best clue in selecting a ring that will be a good match. 5. Not being familiar with a store's return policy: "If a store's policy is too stringent, and you are not satisfied with your ring, you might be stuck with it - which can be a huge problem," Harris said. The solution: Make sure the store you plan to do business with has a reasonable return policy. Adiamor offers a 30-day policy, which allows shoppers plenty of time to resolve any issue. Adiamor, offering diamonds and engagement rings online for over 10 years, announces a special promotion in partnership with Google. On diamond engagement ring and loose diamond orders, Adiamor customers can save $50 by using Google Checkout. Online diamond and jewelry retailer Adiamor is now offering $50 in savings for diamond engagement rings and loose diamond orders when paying with a credit card through Google Checkout (expired). Adiamor offers GIA certified loose diamonds, AGS certified loose diamonds, and engagement rings at Adiamor.com at remarkable savings. Also, all orders for diamonds and engagement rings include free FedEx Priority Overnight shipping and a 30-day no-risk return policy. Now, these savings can be combined with an additional $50 savings through Google Checkout (expired).